Since the beginning of colonisation, it is evident that the medical practices proper to Metropolitan France are hopelessly unsuitable in conditions overseas. The treatment of individual patients one after the other (the "blow by blow method") cannot prevail against the terrible endemics that decimate populations. The Colonial Health Service creates a new service for combating the great endemics, whose efficacy is admired by the world of medicine. But this creation is not immediate and its development is accompanied by some vicissitudes. This service is inaugurated in Cameroon in 1926, it is rapidly extended to French Equatorial Africa (AEF) and, from 1939 onwards, to French West Africa (AOF). Its target is trypanosomiasis. In 1946, having become polyvalent, its action is directed towards other great endemics, at least those which are particularly serious. Depending on the modes of propagation of diseases, their social consequences and the possibility of treating, the fight against the illnesses concentrates on the sick and infectious individuals, the environment of the disease-carriers (vectors) and other breeding grounds of these agents. Finally, the service takes on the responsibility for vaccinations. The territories where the service operates are divided into sectors traversed by one or more teams under the direction of a mobile team doctor. The "brain" which, from 1939 onwards, organises and coordinates the service is the Centre Muraz. If the results of these campaigns have been very positive, permitting the growth of the populations concerned to double in the course of one generation, their limits are obvious. It is only when these countries cease to be under-developed that their people will enjoy satisfactory health standards. An endemic is a disease that is established in a region, a country or a continent. This presupposes a breeding ground of the pathogenic agent (bacteria, virus or parasite) which keeps it alive and allows it to contaminate humans (humans themselves being sometimes a breeding ground as, for instance, in the case of tuberculosis). The term "great tropical endemics" is applied to some fifteen serious diseases, real scourges leading to death or disability whose terrible after-effects remain implacable. The territories where they flourish are exclusively or principally those within the tropics. - By direct contagion from individual to individual, often exacerbated by the absence of hygiene, which disseminates bacteria (cholera, meningitis, leprosy, trachoma...), treponema (syphilis, yaws), viruses (smallpox, measles...) or parasites (mainly intestinal). - By the intervention, in the process of transmission, of intermediary hosts that humans consume, such as fresh-water molluscs and shellfish - planorbis and bulinus for bilharziosis (schistosomiasis), cyclops for Guinea worm (Dracunculus medinensis). Endemics, which are very serious illnesses on the human, social and economic levels, are more numerous in tropical zones than in temperate climates. First of all, there are the endemics common to both the tropical and the temperate zones, even if their frequency and their gravity varies considerably from one to the other. The main reason is that the standard of living of the inhabitants of temperate zones is much superior and, in consequence, the easy access to treatment and the generalisation of vaccination permits neither the implantation nor the propagation of these diseases. Thus tuberculosis, venereal diseases, children's diseases (especially measles), cerebral and spinal meningitis, poliomyelitis, tetanus... may be encountered there but only in isolated cases. Finally, diseases that can be termed real tropical endemics exist - trypanosomiasis, yellow fever, bilharziosis, onchocercosis, Guinea worm - that have never appeared in Europe because of the absence of a specific vector (disease carrier) due to hydro-climatic conditions. The knowledge of the factors which facilitate the implanting and the gravity of endemics is indispensable for improving health standards. These factors can be classified into two groups : environmental factors and human factors. The environmental factors are due, first of all, to a climate that is always hot, often humid. These conditions are ideal for the proliferation of insects that carry diseases, all year long or in the rainy season, in rural regions or in zones of anarchic urbanisation, even after the advent of insecticides. Water is the second major environmental factor. Drinkable water is scarce in rural areas. The well that provides drinking water is in the centre of the village where, on the ground, are to be found animal and human excrements from the surrounding habitations. The faecal peril is permanent. As for human factors, they are the result of insufficient hygiene, both individual and collective, always due to the non-availability of water. Promiscuity in living conditions promotes contagion between individuals. Tradition and ignorance also have an effect in the domain of health. Deforestation and man-made dams to contain water lead to the development of pathogenic agents, vectors (disease carriers), new to the region. Finally, drought, famine, social and political instability, wars and evacuations contribute strongly towards the strengthening or the awakening of endemics and epidemics. As soon as the first dispensaries are opened in these regions where life-expectancy doesn't exceed 30 years, it is obvious that treating individual patients one after the other (the "blow by blow" method) is quite unsuitable in the situation. Diagnosis and treatment must be extended to as many people as possible. The idea of medicine for the masses, at once collective and preventive, has just been invented. But, as in all institutions, an idea is put into action only after some time which, in this case, will be twenty years. One can only envisage the eradication of an endemic when medicines of some efficacy are available. In 1890, at the beginning of the Colonial Health Service, these medicines are not legion. One has to await the progress of chemistry at the beginning of the twentieth century to witness the appearance of molecules easy to produce and having indisputable therapeutic properties. The study of indications and posology helps to perfect individual treatments. But by merely treating the patients who have the disease, one cannot hope to stop its spread. 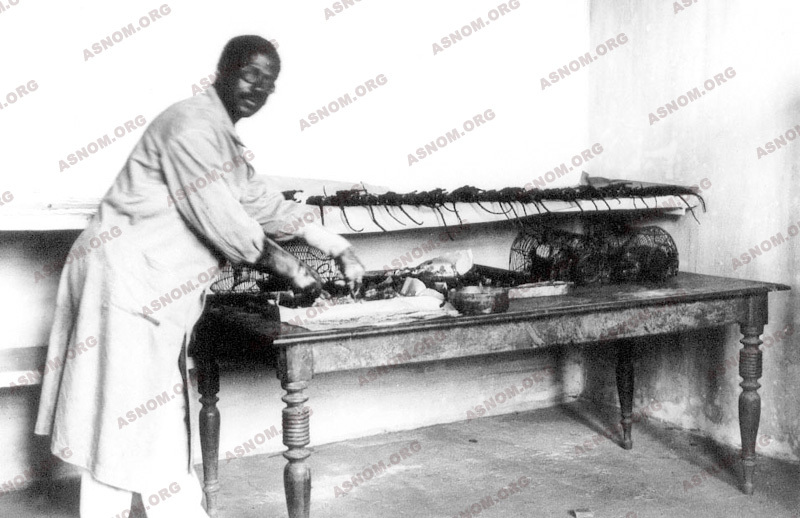 In Africa, faced with the ravages of a dreadful disease, trypanosomiasis, it is envisaged , for the first time, to limit the propagation by treating not only the patients but by going forth to test and treat the whole population, and so guard against the spread of the sickness by sterilizing the human reservoir of germs. A French colonial physician, E. Jamot*, creates the first organisation in the world capable of attaining this objective. The fundamental principles and postulates of the Jamot method may appear to be evident; nevertheless, putting them into practice has required a lot of energy. Tried out for the first time with one single team in Oubangui, it is immediately found to be efficacious and French Equatorial Africa (AEF) is divided into four sectors for trials. Cameroon, which has been confided to France as a mandated territory by the Society of Nations, is, a few years later, the first country where an autonomous service directed by Jamot is responsible for combating trypanosomiasis. In French West Africa (AOF), the situation has not improved and disease is rampant. Another ten years go by before a similar service is created, the general autonomous service for sleeping sickness (SGAMS). The accomplishments satisfy hopes to such a point that, in 1946, an extension of the method makes it possible to undertake the eradication of leprosy with sulphone drugs, then the eradication of treponemal diseases with delayed penicillin, and to try to eradicate malaria with insecticides and synthetic anti-malarial drugs - all these being endemics whose only reservoir of germs is man. The horrors of plague and cholera epidemics begin to disappear with the advent of sulphonamides and antibiotics and, when they are taken systematically by subjects in contact with the diseases, stop the progress of the evil as soon as it is identified. Each endemic has its own means of propagation. The presence of insects in the epidemiological chain constitute the points where attacks are made possible by the progress of chemistry. It is true that the legendary bandits who stole corpses and traversed unscathed the epidemics of plague by rubbing their bodies with a mixture of odorous herbs were the first inventors of anti-flea concoctions and it has been known for a long time that getting rid of lice protects one from typhus. But the means available which permit us to hold at bay recently discovered vectors (carriers of disease) are limited. The biology of these insects must first be studied. This is the objective of the Colonial Health Service which, notably, makes an inventory of the anopheles in Tonkin and the tsetse flies in Upper Volta... It determines the means of stopping proliferation : the elimination of pools of stagnant water in towns to reduce the number of mosquitoes, deforestation and cultivation in the wilds where tsetse flies breed, the introduction of larva-eating fish into ponds... all possible means are used. 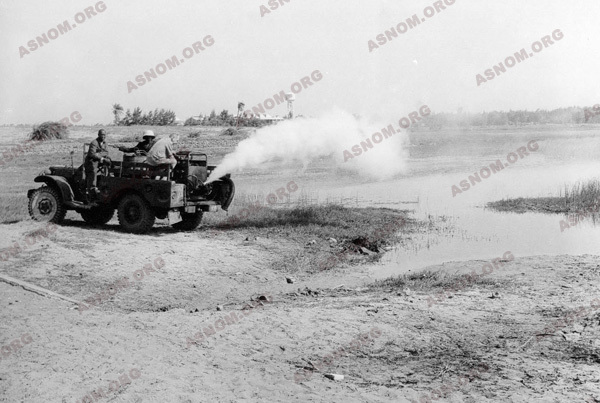 A sensational breakthrough is the discovery of DDT, in 1939, and other more and more efficient insecticides of chemical composition. A good knowledge of the ethology of the vectors that are arthropods becomes necessary to choose the times and places for using these products. The elimination of flees in endemic zones proving to be highly efficacious, the Madagascar Health Service makes great use of insecticides. 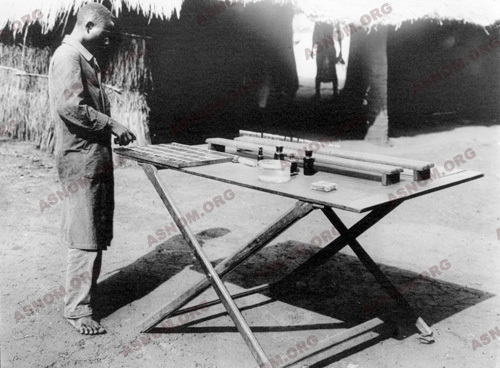 The creation in 1948 of an "anti-malarial" section at Bobo Dioulasso provides the SGHMP with research workers who establish a complete chart of the anopheles-vectors in the federation of French West Africa (AOF), study their ecology and participate in the World Health Organization's efforts to eradicate the vectors all over the world from 1956. Thus it is that, in Bobo Dioulasso, Thiès and Dahomey, pilot zones are created where the regular spraying of residual insecticides on the walls of houses is carried out. Similarly, the fight against mosquitoes, carriers of yellow fever, is encouraging. From 1955, the researchers of the ORSTOM join the entomologists of the SGHMP in the study of black flies, these little black midges that inoculate onchocercosis. The Conference of Tunis in 1968 uses these results to set on foot a gigantic programme for the eradication of this disease with the cooperation of national governments and major United Nations organisations. Many tropical endemics are not exclusively dangerous to humans. Some wild rodents are also victims of plague and if a domestic rat is contaminated out in the bush, he will bring the epidemic to the village. So in 1910 the Colonial Health Service undertakes campaigns of rat extermination in Madagascar and in Indochina, where plague is still present, by giving a reward for every rat handed over. Then came the rat poisons which are infinitely more efficient. The biological cycles of some parasites go through an aquatic stage. That is the case of the schistosoma, responsible for a very wide-spread and debilitating endemic : bilharziosis. Eggs from this sick creature is transformed into larvae which penetrate the organism of molluscs, usually present in fresh-water ponds or creeks. There they suffer an evolution and come out in a form that is infective, cling to the skins of bodies emerged in the water, traverse the whole surface in a few minutes and give rise to a slight pruritus (scratching sensation). In the case of dracunculiasis (or Guinea Worm), transmission is effected by the absorption of a minute fresh-water shellfish present in drinking water. In 1967, the Muraz Centre is provided with a "parasitological" section which investigates the environments where bilharziosis proliferates. This is an important matter because, on the one hand, molluscs are the "weak point" and therefore vulnerable stage in the epidemiological chain and, on the other hand, their chemical destruction should neither pollute the water nor destroy the source of protein that the fish represent. Agricultural development projects are moreover based on the creation of new containers of stagnant water. It is extremely worrying to note the aggravation of the bilharziosis endemic in all places where dams are built. Louis Pasteur is at the height of his fame when the Colonial Health Service is created in 1890. As he is himself not a physician, the Academy ignores him. But military doctors, not belonging to any university clique, gather round him, especially naval and colonial physicians whose appointments will send them to distant lands where deadly diseases are on the rampage. As each of his students leaves, he hands over a base of anti-smallpox vaccine and a piece of rabbit marrow which serves to prepare the vaccine against rabies. Rabies becomes rare in Indochina, a country in which animals, even rabid, cannot be killed for religious reasons. As soon as he arrives in Saigon, Calmette* sets up the production of vaccine against smallpox and the general vaccination of the Indochina populations is undertaken even before the process ends in metropolitan France. As early as 1891, 120 000 vaccinations and re-vaccinations are practised using pulp extracted from the udders of infected buffalos. As this anti-smallpox vaccine is difficult to conserve, vaccination centres are multiplied and the method is extended progressively to the whole of Indochina. In 1904, the first qualified Indochinese auxiliary physicians make it possible to have a competent staff for vaccinations. By 1930, smallpox has practically disappeared from Indochina. It will reappear after 1940, at the time of the conflicts. In Africa, conditions are different because another disease, yellow fever, manifests itself in terrible epidemics. From 1892 to 1939, the campaigns of anti-smallpox vaccination are conducted by the physicians of the AMI. The agent of yellow fever is isolated only in 1927 and the first vaccine is developed by Laigret* in 1932, modified by Peltier* in 1939. That year the vaccine against smallpox and that against yellow fever are combined into one vaccination by scarification. The SGHMP takes over the task and these associated vaccinations will be conducted directly by the Muraz Centre. 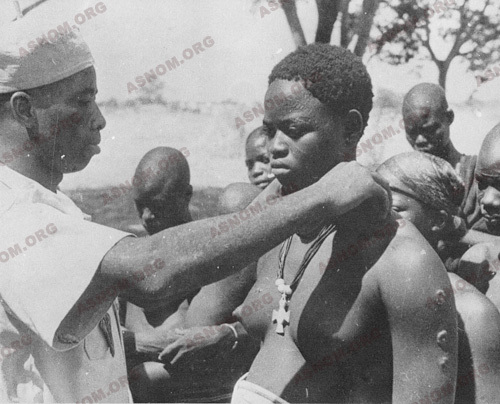 Eighteen years later, in 1959, for the single territory of French West Africa, 31 million vaccinations by scarification have been practised. A great advance in scarification is brought about by the use of the bifurcated needle instead of the vaccinostyle, much more difficult to manipulate and much more aggressive. At the dawn of independence in the African states, smallpox has disappeared. If today vaccination against smallpox is not required for entering these countries, the credit is undoubtedly due to the Colonial Health Service. In the 1960s, the Rockefeller Centre proposes an antiamarillic vaccine that can be injected, less painful than the vaccine of Dakar. The transcutaneous automatic jet injection which guarantees against sterility permits the number of persons vaccinated in an hour to be multiplied by ten. The vaccinations by scarification are stopped. 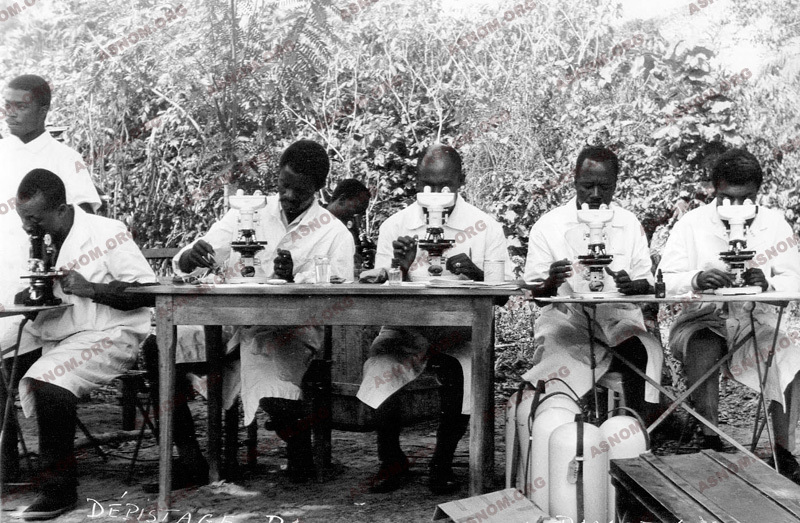 A new era begins which sees, from 1962, Labusquière* initiating in Upper Volta the first campaigns of combined vaccinations against measles and yellow fever. The OCCGE takes over from there and, twenty years later, in 1974, the World Health Organization launches the programme of mass vaccinations. It would be illusory to imagine that the fight against the great endemics could end with a complete and final victory, using only medical and biological means. The underlying problem is socio-economic and cultural. Political instability and interethnic wars are always followed by a degradation of the health situation. Moreover, the means resorted to lose their efficacy because the pathogenic agents, such as vectors, build up resistance. New endemics emerge. The solutions provided by the Colonial Medical Service were pertinent at the time they were applied. - It has been clearly demonstrated that the provision of drinking water reduces the mortality rate and morbidity better than the presence of a medical team or the existence of big hospitals. - Similarly, when pregnancies take place at two-year intervals, the mortality of first-born children is reduced by 40 % (Mazer*). Convincing couples to space out births promises a result that no programme of child protection could attain. Of these two examples, one is in the domain of economics (the financing of water conveyance), the other in the domain of culture (fecundity being considered a blessing from Heaven). Fortunately, these two domains are developing like living standards and mentalities : a survey made in Mali in 1987 shows that nearly 25 % of married women would use birth control methods if they were easily available.